With a heavy base that sports a slightly grippy bottom surface, the dock securely holds both devices. You can poke away at a Plus-size iPhone screen and even depress the Home button with absolutely no concern that the Belkin PowerHouse will slide around. Both the phone and the watch seem surprisingly safe when docked. A built-in Lightning connector with some well-though-out features adds to the sense of security. The Lightning tip moves smoothly forward and backward to make it easier to slide your iPhone onto it. And a dial hidden on the back of the dock lets you fine-tune exactly how far the Lightning connector protrudes from the base of the PowerHouse, enabling it to work with virtually any kind of iPhone case. Once you’ve adjusted the height, it couldn’t be easier to place the iPhone in the dock and start it charging. And the powerful magnet in the built-in, circular charger makes it beyond simple to get your Apple Watch on its way back to a 100 percent charge. Every aspect of the PowerHouse feels well-engineered and sturdy. It’s like something from the 1930s, when designers didn’t fawn over lighter-than-air products and manufacturers didn’t shy away from using big chunks of steel. Since the Belkin PowerHouse uses a single AC cable to charge both devices, you won’t need a Lightning cable or the inductive charger that comes with every Apple Watch. Since the Belkin PowerHouse uses a single AC cable to charge both devices, you won’t need a Lightning cable. That said, the Belkin PowerHouse doesn’t look like a throwback to the golden era of chrome. It looks sleek, modern and a bit generic. Its square white base with rounded corners calls to mind an EarPods case. The same grippy, charcoal-gray material that coats the bottom of the dock also covers the back panel, which supports the iPhone, as well as the small extension that juts out to hold the Apple Watch. The two-tone color scheme makes the combo charger look less bland than if Belkin had gone with an all-white design. Unfortunately, the gray Belkin logo on the front distracts from the clean look. The PowerHouse won’t win any gadget beauty pageants, but it’s pretty inoffensive as far as charging docks go. 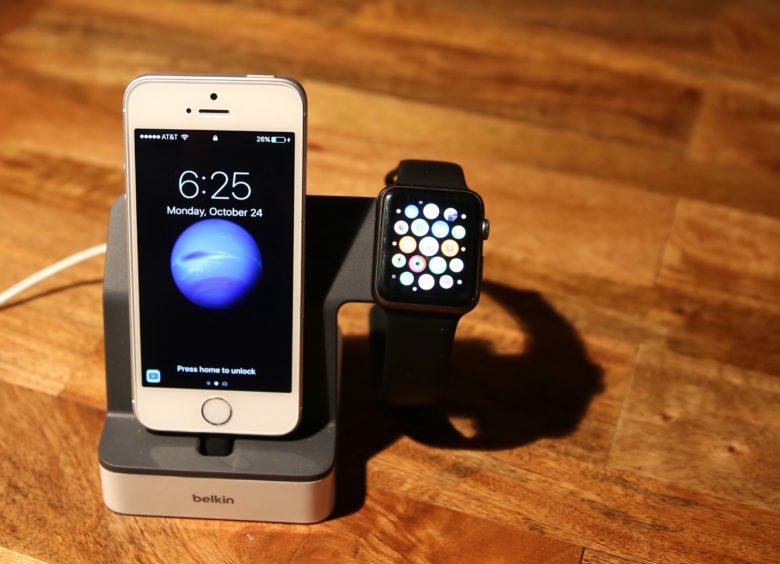 The combination iPhone and Apple Watch charger packs plenty of power to speedily juice up both devices simultaneously. That’s the main function, after all, and after several weeks I can find no fault at all with the dock’s charging capabilities. However, there are some things the PowerHouse won’t let you do. Because it holds your watch in an upright position (just how it sits on your wrist), you won’t be able to use the handy Apple Watch Nightstand mode. And if you like to use wired headphones with your iPhone while it charges at night, you’re out of luck. You won’t be able to plug in a headphone jack (which admittedly won’t matter with the iPhone 7). The PowerHouse’s Lightning connector just won’t extend far enough to accommodate a standard 3.5mm audio plug. Finally, the PowerHouse won’t let you get off cheap: At $99.99 list, it’s far from the least expensive combination Apple Watch and iPhone dock on the market. Factor in the fact that you won’t need a separate Lightning cable, Apple Watch charger or power adapter — as you do with some competing charging docks — the price doesn’t seem out of line. The fact is, no charging dock will suit every single person searching for an antidote to bedside clutter. If these minor issues don’t matter to you, the solidly built Belkin PowerHouse is just what the doctor ordered. 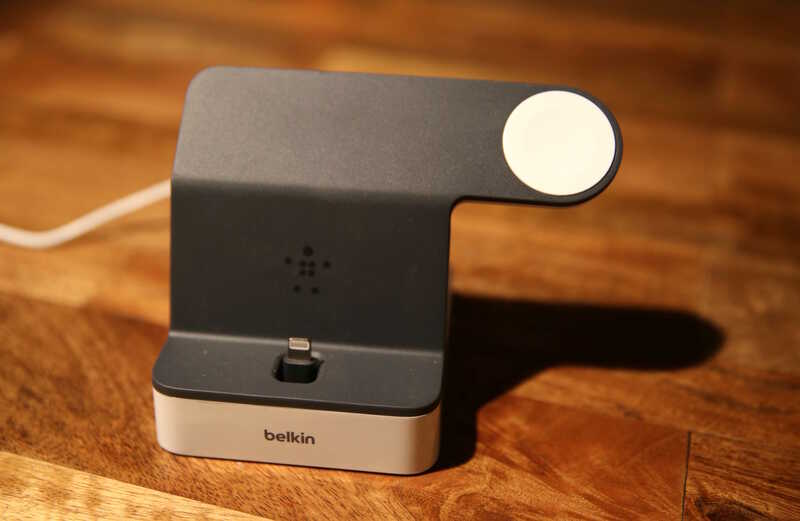 Belkin provided Cult of Mac with a review unit for this article. See Cult of Mac’s reviews policy and check out more stuff we recommend in our Best List reviews.